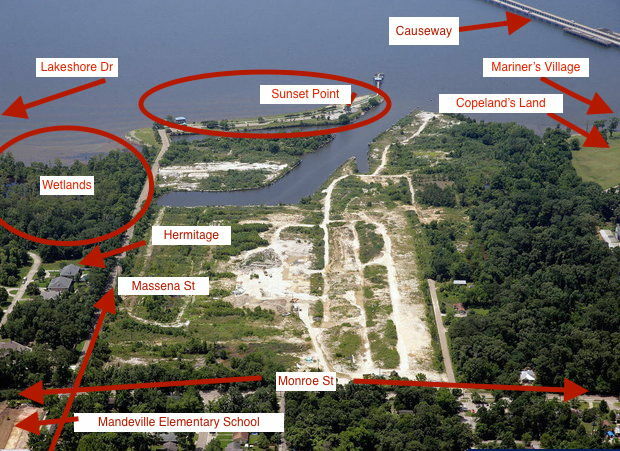 The intent of this blog post is not to share my opinion (that may come later), it is to list 40 current facts about Mandeville’s newest proposed development, called “Port Marigny.” As residents of West St. Tammany, we should all be informed of something of this magnitude. I’ve taken the liberty of sketching in a few landmarks from the aerial view photo on the left (click to make larger). The empty space, portions of the waterways and all the green trees on the right – are the approx. 78 acres being proposed for development. The bright colored drawings on the right (click to make larger) are a portion of a larger drawing. Note – this does not include the hotel or commercial portions of the development. It is proposed to become a colossal development, with a mix of commercial and high density residential. Drs. Michael and Marcus Pittman own the property. The brothers purchased it at a sheriff’s sale in 1984 for $2.84 million. Charette’s took place in April, lead by the hired architect Steve Oubre. CLURO = Mandeville’s Comprehensive Land Use Regulations Ordinance. The architect for the new development, participated in writing parts of Mandeville’s CLURO. The city has hired its own consultant – David Bailey, who is the city manager for Rosemary Beach, Fla., – to help local government officials evaluate the project. Monroe St. is a small suburban 2 way street, running east-west between the Causeway and Old Mandeville. Many in Old Mandeville commute via Monroe to the Causeway, where they will often get stuck in long lines of traffic at peak hours, or if delays on the Causeway. Massena St is “one way” during school hours, exiting onto Monroe. It is backed up a long way during peak drop-off and pick up times. Home ownership opportunities in the current proposed plans: 57 cottages, 52 single-family village homes, 52 townhouses, 48 single-family neighborhood homes, 28 condominium units. In the proposed plan: a 120-room hotel on the southwest corner of the property, adjacent to the Lake Pontchartrain Causeway. 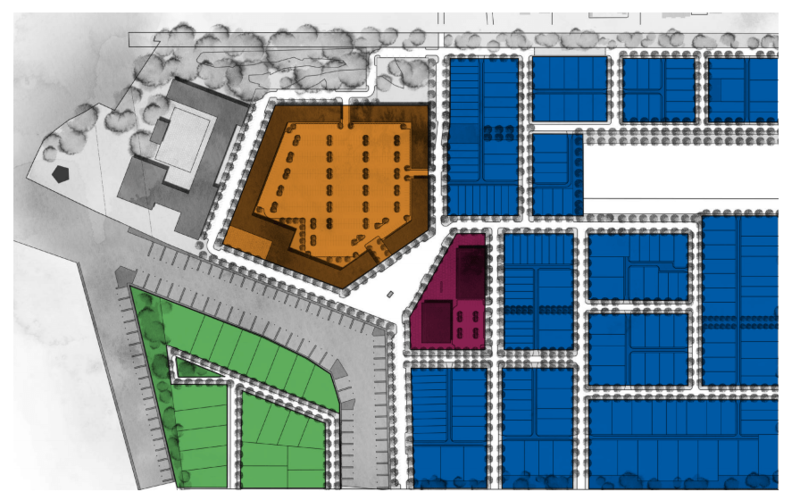 The architect claims that people living in and around the new development will be less likely to drive often as they can readily walk to local commercial establishments and the Lakefront. The architect references certain studies that support his assertions. DOT estimates the number of vehicles per household to be 1.9 = with 429 units = 815 estimated additional vehicles. (does not represent commercial, marina or visitor vehicles). The architect claims the proposed development meets or exceeds Mandeville planning and zoning standards as outlined in a 2007 Master Plan. The development is requesting a building variance to import fill to the site to provide suitable soil for growing grass, plants and trees. The 2010 census shows that the average household size was 2.46 and the average family size was 3.11. The density was 1,543 people per square mile. 4,669 housing units at an average density of 686.9 per square mile. 70448 and 70471 make up City of Mandeville. This development will ultimately have an impact on all residents and businesses in West St. Tammany, not just those in the City of Mandeville city limits. Council District 3 (correction 8/19 to 2 and represented by Carla Buccholz) (where the proposed development is situated) has just under 4000 residents in 640 acres. Its current population density is approximately 6 people per acre. The proposed development, at 76 acres with 429 housing units planned, would be almost 12 people per acre. The landowner commissioned a Traffic Impact Analysis (TIA). The TIA was performed by Hall Planning & Engineering, INC. from Tallahassee, FL. No traffic counts were performed by Hall Planning & Engineering, INC. during the course of the study. References to traffic count baseline data, were cited as (Louisiana Department of Transportation 2013 estimated counts) Mandeville Police Department traffic warning signs. The City of Mandeville has commissioned its own engineering firm, Digital Engineering and Imaging Inc, to review the TIA submitted by the landowner. Page 4 of the TIA indicates vehicle traffic counts in year 2012 on Monroe Street, are less than traffic counts 15 years ago in 1997. Because the proposed development is pitched as a “New Urbanism” concept with “Walkability” features, the landowners TIA estimated additional vehicles/trips normally ascribed to the total number of estimated additional dwellings, was arbitrarily reduced by 30% (Table 2 Trip Generation page 8 of the TIA). There exists a 2006 “OLD MANDEVILLE REDEVELOPMENT STRATEGY” document in which a “2005 Transportation Analysis Study for Downtown Mandeville” is cited on page 19. The 2005 transportation study recommended widening Monroe St. from 2 lanes, to 3 lanes from Massena St. to Causeway, in anticipation of eventual development of the Pre Stress property. The landowners suggests that they will acquire property adjacent to Mariner’s Village and provide a cut thru from the proposed high density development onto Mariner’s Blvd. Monroe St. in front of the pre-stress property is sometimes closed to traffic by the Mandeville Police Department due to heavy storm water runoff/flooding. There are 5 city Council members who will approve or deny this high density development. There are 7 Planning & Zoning commissioners who will review the landowners plans and subsequently make recommendation to the city council. *** Sources for this post: Nola.com Facts & Figures post, Stop High Density Facebook Page (Brian Rhinehart), Mandeville District 3 Facebook Page, Emails from City Councilman Ernest Burguiere, Mandeville City Data , City of Mandeville Port Marigny uploaded links, overhead picture from here here. 2012 article here, misc. article here, Fox 8 story here WDSU here. US Census info here and here. Monroe St.already has some pretty bad traffic. I’m not sure about the city of Mandeville’s charter but it’s a shame they couldn’t have purchased the property. I have been notified that fact 29 should be corrected. The Port Marigny development is in District 2 that is represented by Councilwoman Carla Buchholz.